A screenshot from the game Mario vs. Donkey Kong 2: March of the Minis. Pink Blocks are visible at the top of the left side of the window. Pink Blocks are objects that appear in the games Mario vs. Donkey Kong 2: March of the Minis, Mario vs. Donkey Kong: Minis March Again!, Mario vs. Donkey Kong: Tipping Stars, and Mini Mario & Friends: amiibo Challenge. The object consists of two Pink Blocks which appear to have circular objects inside them and a row of Pink Blocks or dotted outlines of blocks between them. 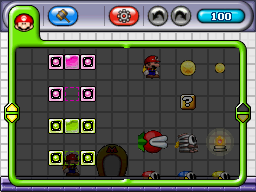 Pink Blocks made their first appearance in the first level of the first world of the game. In March of the Minis, the player must tap the blocks with the stylus. This would turn all the blocks in between the two outer pink blocks into dotted outlines of the blocks. These blocks would then be stockpiled in a small counter at the bottom of the screen. If the number of blocks stockpiled away is sufficient, the player could tap a row of empty blocks to make them into real blocks, subtracting the amount of blocks used from the counter. In Minis March Again!, Pink Blocks are now independent of each other. Tapping an empty Pink Block space will fill it in, if the player has a usable Pink Block. Additionally, swiping the stylus across multiple spaces will empty them or fill them in, depending on if the first block touched was filled in or not. They serve the same purpose in Mario vs. Donkey Kong: Tipping Stars, where they first appear in Twilight Valley, and Mini Mario & Friends: amiibo Challenge, where they are first seen during Level 7. This page was last edited on March 10, 2018, at 18:09.